A collection of nine sophisticated studio effects. Sleek, intuitive and powerful. Each effect comes as a separate plug-in, so you only load what you need when you need it. Create crazy effects chains or add a delicate final touch to your projects. Uhbik supports common surround formats. From subtle to spectacular, Uhbik is ready. Uhbik is a diverse set of audio processing tools, with familiar controls plus some unusual options for more creative possibilities. They all share a common philosophy: high quality sound and ease of use. The Uhbiks share certain features, most notably surround sound: All of them can handle up to 8 audio channels including popular formats such as quadrophony, 5.1 and 7.1. No special version required, no confusing extra controls. Everything is right there and ready to go. Good reverb is seldom conspicuous, but when it is not there you notice something is missing. Uhbik-A combines plate reverb and early reflections, with full control over each part to build the style of reverb you need. Sometimes you want a subtle touch of ambience, other times you want to float in space. 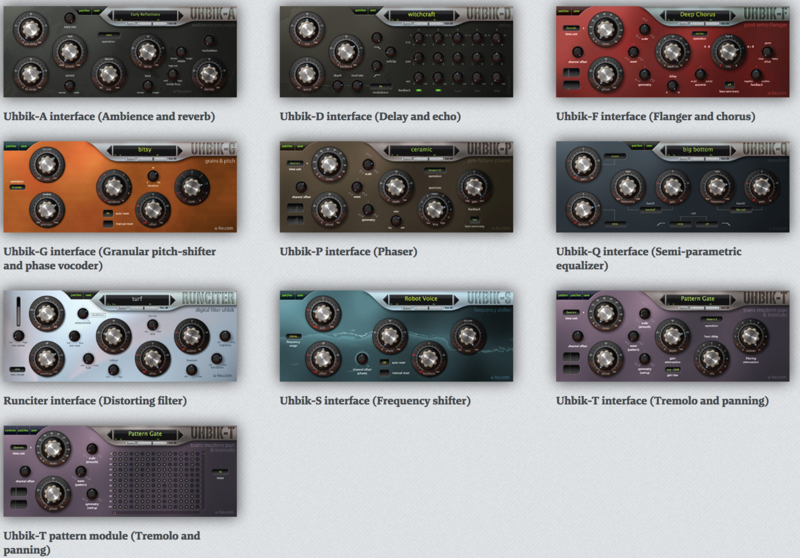 Uhbik-A has three operation modes designed for different reverb styles. All three share common controls that determine the spaciousness and feel. Bass and Treble shape the reflections, mimicking the absorptive properties of natural environments. Add subtle space and texture or blend sounds together into warm clouds. Uhbik-A is a master of understatement. Inspired by classic tape echo units, Uhbik-D is a creative tool for vintage-style delays with digital enhancements. Borrowing from the world of analogue tape echo, Uhbik-D has five taps (playback heads), time (tape speed), and feedback. Two filters and modulation controls add subtle to dramatic colour and motion to your delays, similar to those older tape machines. Freed from the limitations of the real world, however, Uhbik-D can perform other tricks: Adjust each tap for extremely short delay times, feedback patterns, or create surround sound delays. The flanging effect comes in two traditional flavours: the twin tape machine method and the bucket brigade stomp box type. With Uhbik-F you get both—even at the same time if you want. In through-zero mode (tape machine method), the audio is duplicated and the playback speed of one signal is slowed or sped up to create a dramatic “whooshing” effect. The LFO and the built-in delay determine the intensity and character of the flanging effect. The guitar pedal type delivers more subtle, chorus-like sounds by feeding back very short delays and modulating their delay times. In Uhbik-F you can choose either type or a mixture of the two. Uhbik-F comes with a few extras to enhance your final effect: Drive, a highpass filter to manage bass frequencies, and a feedback control (positive or negative) for intensifying the resonance in one of two different flavours.